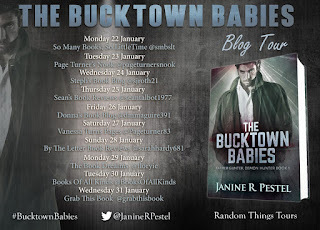 Today I am kicking off the blog tour for The Bucktown Babies, a supernatural book with demons, skulduggery and danger at almost every corner! Thanks Janine for stopping by and taking time out to answer some questions. Q: First thing I have to ask, what inspired the book? 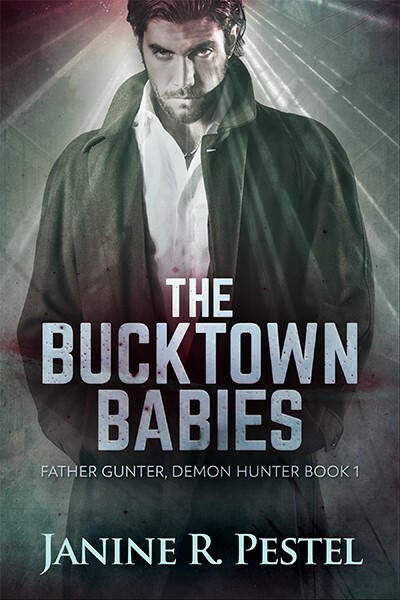 A: The idea for the book “The Bucktown Babies” pretty much just “popped” into my head one day. I was driving, and this idea about a gun toting nun who fought zombies and demons came to me. I thought it over, and it eventually morphed into a former priest who fought demons. I did some research, and found the demon that was responsible for infant mortality and miscarriages, and “The Bucktown Babies” was born. Q: Will there be more to the series? A: Oh, yes. Lots more. The second book in the series “The Raven Flies at Night” has just been published by my publisher – Creativia Publishing. 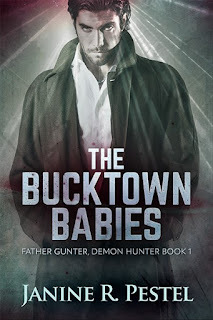 In that book, which is a little darker than “The Bucktown Babies,” something is revealed that will take the series in a new, darker, direction. Q: I was left with a lot of questions, was this deliberate as there will be more books? A: Yes. It is a continuing series, and in each book, there will be answers…and, of course, more questions. Q: Will all questions be answered in future books? A: All questions will be answered…eventually. Some questions were even answered in the first book, although the answers were subtle – the lack of religion in the town, etc. Q: Demons are the main entity in the book however another unnatural appeared, will this theme continue in other books? A: Yes. Sometimes demons use “other entities” to help them fight. These entities could sometimes be things like Banshees, or sometimes the undead. I tend to like it when unexpected things happen, because in real live, the unexpected happens. Q: What research did you do for the book and did you enjoy it? 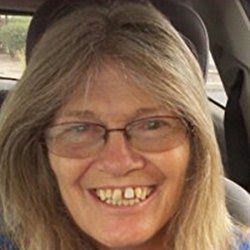 Anything freaky or unusual to share? A: I researched demons. I wanted to find out what demons were responsible for what evils. This way, there is a little bit of accuracy in the books in the series. Take, for instance, the demon in “The Bucktown Babies.” If you google that demon, or look it up in demonology, you will find that it is the demon that is responsible for infant mortality and miscarriages. Q: This is the first book I have read by you, do you have others and if so are they of the same genre? A: I have earlier books that I have written. The first book I wrote was a science fiction novella titled “The Mons Connection.” The inspiration for that book came from Ancient Alien theory. I also have four short stories, three of them horror – “The Servants,” “Harry,” “The Visit” and one of them I wrote to help people heal after losing a pet – “Wait at the Rainbow Bridge.” “The Visit,” is actually not horror…more of a touching story. The last ting I have would be a small compilation of horror stories – “Infected and Other Short Stories.” This compilation has the short story “Infected”, along with “Harry,” “The Servants,” and “The Visit.” There are also audiobooks of several of my books. Q: What is next for Janine? A: To continue the “Father Gunter, Demon Hunter” series, along with some new ideas that I have for a new series and a few stand-alone horror stories. I’m hoping for at least 3 new books to be published in 2018. Q: Where can fans find you? A: They can like me on facebook at http://www.facebook.com/JanineRPestel they can also follow me on twitter at http://www.twitter.com/janinerpestel or my website at http://www.janinepestel.com One final note: I am always looking for people to join my “street team”. For details, visit my website. Q: Anything else you may want to ask that I might have missed? A: Not that I can think of. Thank you so much for interviewing me. It has been my pleasure. Thank you so much Janine for a great Q&A, I look forward to the next in the series. 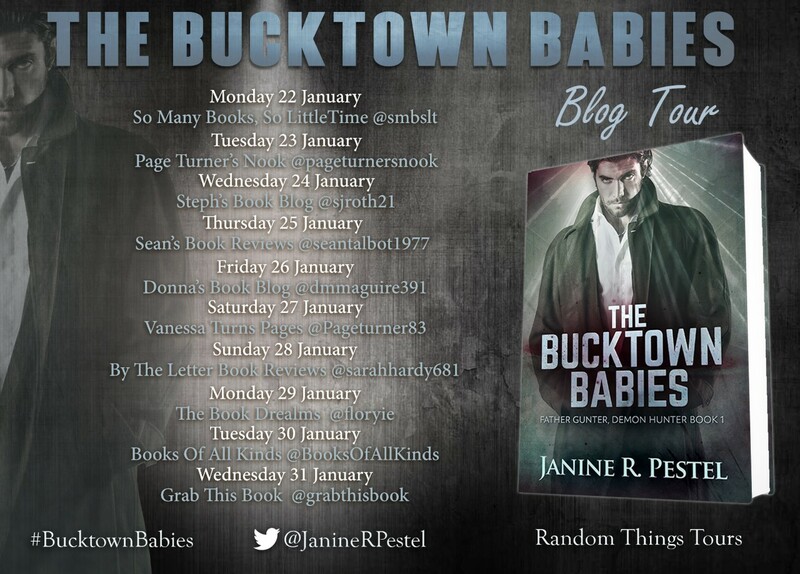 Please check out the other stops on the blog tour as shown in the poster below. Many thanks to Anne Cater for arranging a great blog tour, asking me on it and introducing me to a new spooky series. This sounds like a scary-good book! I enjoyed the Q & A. The book sounds like a lot of fun. Demons, banshees and demon hunters can be so entertaining. This is a good concept for a series. Janine is an energetic livewire. Three books in one year is a fantastic number. Watch out Steven King.